He was also partly responsible for the transformation of science from a hobby of the wealthy to a real profession, open to people of different classes. Born September 14, 1769, in Berlin, Germany, Humboldt and his brother Wilhelm were privately educated in the classics. After he became acquainted with mineralogy and geology at the University of Göttingen in 1789 to 1790, he sought further training in those areas at the School of Mines in Frieberg. Humboldt was appointed in 1792 to the Mining Department of the Prussian government. He supervised mining activities, invented a safety lamp, and established a school for miners. But his passion was exploration. In 1797 he resigned his position in order to gain field experience in meteorological and magnetic measurements. In 1799 Humboldt and botanist Aime Bonpland went to Central and South America to study the grasslands of Venezuela and the Orinoco River basin. Humboldt also explored the Andes, becoming the first to attribute mountain sickness to insufficient oxygen at high altitudes. He studied the oceanic Peru Current and went back to Europe with immense amounts of data on Earth’s geomagnetic field, temperatures, and barometric pressures over the years of his journey; previously unknown plants; and extensive measurements for new maps. Upon his return to Paris, Humboldt spent the years between 1804 and 1827 writing and publishing 30 volumes related to the data gathered on his trip; these volumes were called Personal Narrative of Travels to Equinoctial Regions of the New Continent. His descriptions included meteorological patterns that laid the foundations of comparative climatology; dynamism of Andean volcanoes as evidence of ongoing development of Earth’s crust by eruptive forces; and relationships between geography and the fauna and flora of various locales. 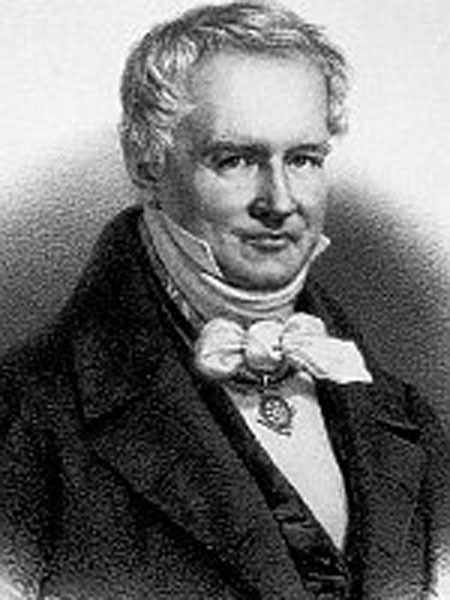 Humboldt returned to Berlin in 1827 as tutor to the Crown Prince and also taught physical geography at the University of Berlin. In 1828 he organized one of the first international scientific conferences. Humboldt coined the word kosmos—meaning the exquisitely ordered system of the global environment. During his last 25 years, Humboldt wrote a set of books that he named Kosmos. One of the most extensive scientific works ever published, the books were best sellers and were translated into nearly every European language. In these books, Humboldt emphasized unity and global factors that link diverse environments and their inhabitants. All plants and animals, he noted, were subject to the same laws of temperature that affected both the horizontal geography of latitudes and the vertical geography of altitudes. He was the first to classify forests as tropical, temperate, or boreal, terms in use today. He also coined isotherm and isobar for lines on maps connecting places with the same temperature or pressure, respectively, as he illustrated climate as a unifying global force. He died in Berlin on May 6, 1859, while writing the fifth volume of Kosmos. Humboldt put the concept of nature’s interrelationships into the mainstream of scientific thought. He did not see nature as chaotic and therefore in need of human control. He believed that the natural world was a web of harmonious interactions and tried to map some of the connections. He held up the natural world as an ideal model worthy of respect. Not until RACHEL CARSON (1907­1964) did another scientist incorporate human survival firmly within the environment instead of viewing it on or above it. Humboldt’s influence was immediate and direct. Humboldt supported young academics such as chemist Justus von Liebig and zoologist LOUIS AGASSIZ. CHARLES DARWIN was another of his disciples; Humboldt’s book on the New Continent was one he read during his voyage on the Beagle. In fact, the word “scientist” first entered the English language in the 1830s to distinguish men like Humboldt and Darwin from natural historians. The endurance of Humboldt’s theories can be seen in the continued use of his classification system for forests and the use of the cartographic terms isotherm and isobar. As environmentalists would do in the late 1900s, Humboldt worried about differentiating between natural and unnatural rates of change, the social consequences of resource exploitation, and educating people that each part of the living world is valuable. His message resonates today.